With the Kingsford® Easy Light Bag, charcoal grilling has never been simpler. Just light the bag and get grilling — no prep and no lighter fluid needed. 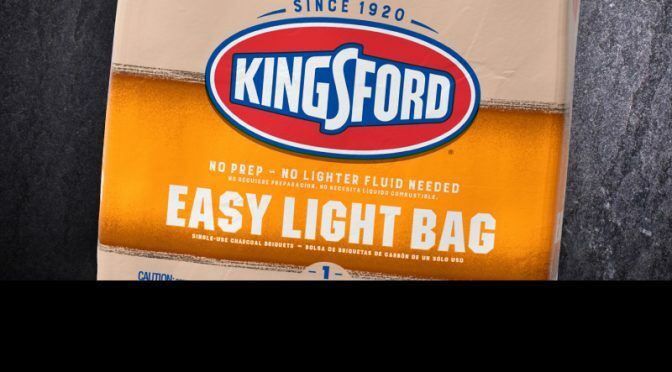 Kingsford® Easy Light Bag is a single-use bag that lights instantly* with the strike of a match, allowing you to charcoal grill almost anywhere. And Easy Light is made with North American wood and the same quality ingredients as Kingsford® Original, delivering that authentic wood-fired BBQ flavor—instantly. * Available in a one-use, 4-lb. bag. For Your Safety •	Never use gasoline to light Kingsford® Competition Briquets. •	Do not add lighter fluid directly to burning or hot briquets. •	Grill should be placed on a flat and level surface away from flammable items, overhangs and trees. •	Store briquets in a cool, dry place. •	California Proposition 65 Warning: Combustion (burning) of this product, like other cooking methods, produces carbon monoxide and other substances known by the State of California to cause cancer, birth defects, or reproductive harm.